Imagine yourself flying like a bird across the tranquil skies of Rio and over the tropical beaches surrounded by the Atlantic Rainforest. Even if it is to be your first time, you can expect to have a truly exhilarating experience. 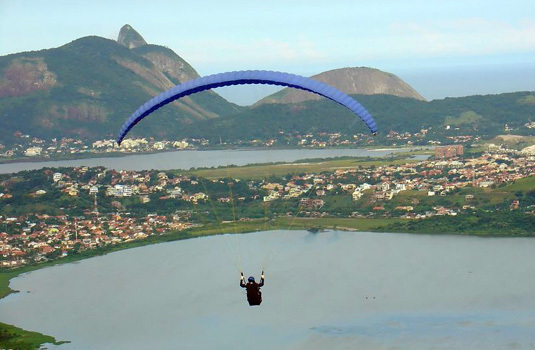 Hang gliding tours are offered by professionals for people of all ages. Most tours originate from the Pedra Bonita hang gliding ramp at São Conrado, within the Tijuca National Forest. Before you find your wings a professional and certified instructor will brief you on the basics of hang gliding, with an emphasis on safety procedures, so you needn’t worry about crashing to the ground and cutting short your holiday. Once you have received all the instructions, preparations are made to set you off from the ramp. The final lift off from the ramp is an experience you will never forget as you begin to join your feathered friends high above the ground. Flights are held every day throughout the year, so no matter what time you visit Rio you will be able to venture into the skies. Flights are cheaper on weekdays so if you have the time you can end up saving a bit for an extra flight. During your flight, you have the opportunity to grab the best views of Christ the Redeemer statue on Corcovado, Sugarloaf Mountain and the beaches of Copacabana, Leblon and Ipanema. As you fly over the Tijuca National Forest, you can experience some of the native wildlife of the forest. You can take home those precious moments since every glider is fitted with a remote control wing tip camera. A hang gliding tour costs around US$ 80, which may sound steep, but not higher than you will feel once you soar in the sky.